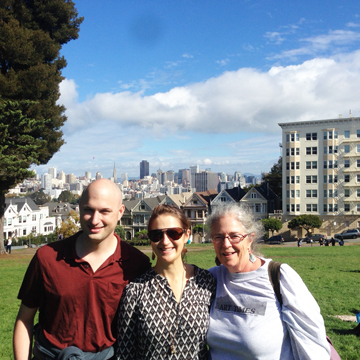 We arrived in San Francisco and had arranged for Heidi’s son Matt to join us for the day. We headed to a place for brunch and walked up and eventually down several of the hills. We walked to the Alamo Park which gives an excellent view of San Francisco and a few of the “painted Ladies” beautifully painted Victorian homes. Our first day in San Francisco and we woke up to rain. We thought to go to the de Young Museum but as it was Monday it was closed. 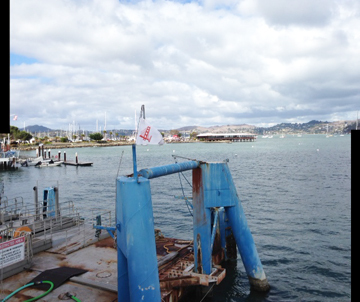 As we slowly began to pull it together and the rain eased off we decided to take a ferry ride and go to Sausalito. While waiting for the ferry we found the Musée Mécanique at Pier 45 founded by Edward Galland Zelinsky (1922-2004) and now run by his son Dan. The museum has over 200 working coin-operated machines in the 1800s through the present day video games. What an interesting place. 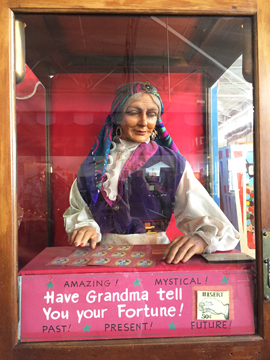 Just put in the coin and you could get your tarot reading, palm read, watch puppets dance, and so much more. The ferry ride took us past Alcatraz and then we had great views of the Golden Gate Bridge and the Oakland Bridge. On to Sausalito, a charming City with a huge marina, luxury shops, galleries and restaurants. 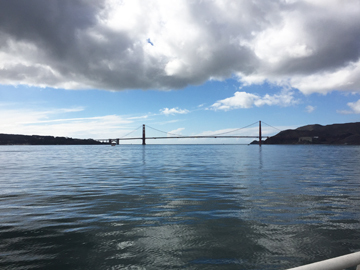 There were sailboats in the water, the sun was shining and the Golden Gate Bridge right before us. We walked around, had a delightful lunch, and met a delightful couple visiting from Taiwan before taking the ferry back to SF. Then it was off to the Ferry Building to meet up with Ellie. The Ferry Building, located at the foot of Market Street, houses numerous food shops that offer artisan cheeses, meats, breads, coffee, oil and vinegar, candy/ fudge, local fish and more. 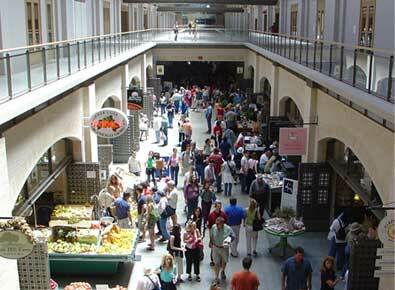 There are restaurants and cafés serving a wide variety of foods. There are offices on the upper floors. Opening in 1898, the Ferry Building became the transportation point for anyone arriving by train from the East. From the Gold Rush until the 1930s, arrival by ferryboat became the only way travelers and commuters—except those coming from the Peninsula—could reach the city. At its peak, as many as 50,000 people a day commuted by ferry. 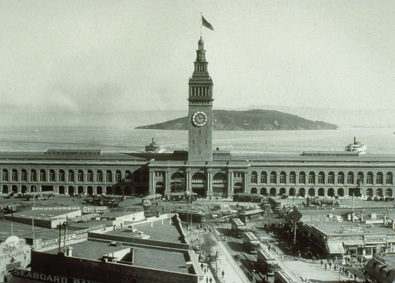 In 1892, a bond issue to build a new Ferry Building was passed and a young architect named A. Page Brown drew up plans for a large, steel-framed building. Brown’s foundation—which has supported the entire steel-framed structure held strong through two earthquakes (1906 and 1989), became the largest such foundation for a building over water anywhere in the world. The need and therefore use of ferries decreased with the opening of the Bay Bridge in 1936, and the Golden Gate Bridge in 1937 and by the 1950’s, the Ferry Building was used very little. 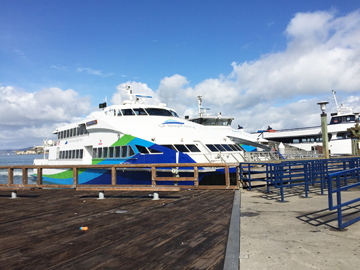 Today, after a major renovation, ferry terminals operate at Larkspur, Sausalito, Vallejo, and Alameda with plans for continuing network improvements and expansion. The Tower of the Ferry Building is a 245-foot tall clock tower, with four clock dials, each 22 feet in diameter, can be seen from Market Street, a main thoroughfare of the city. The ferry Building was like Grand Central Station in many ways, a central point for commuters to get to their destination. Trains are still a critical part of the transportation system in NYC and I hope will remain so. We met Ellie and went to Sotto Mare Oysteria and Seafood Restaurant, a neighborhood restaurant where we had delicious food; Heidi and I shared their Crab Cioppino that had a mixture of Pacific Coast seafood. Back to Ellie’s lovely apartment and the following morning we headed out to Napa.